This week’s muffins come from the wonderful Dorie Greenspan. If you’ve been around these parts for a bit, you already know I’m kind of a fan of her. She’s just so warm, friendly and incredibly talented. So when I saw that we were making one of her muffin recipes this week, I was giddy. That being said, I totally changed it. You see, these muffins are called coffee break muffins presumably because the original recipe has both a cup of strong coffee in it as well as espresso powder. Both ingredients are staples in my household. However, when I got to baking I came to realize that both of those items were nowhere to be found! So what’s a girl to do except push on through and think of a plan B. Coffee or no coffee, these muffins are out of this world and would be the perfect treat during your coffee break. I made a cinnamon buttermilk muffin scattered with apples and finished it off with a walnut streusel topping. I’m having to ration them so that Maddy and Mike don’t devour them within a day! They’ve definitely been starting our mornings off right around here. – Preheat oven to 400 degrees and place a rack in the middle of the oven. Line a 12-cup muffin pan with baking cups. – In a large bowl, whisk together the flour, sugar, baking powder, cinnamon and salt. Then add the brown sugar, making sure there are no lumps. – In another bowl, whisk together the buttermilk, melted butter, egg and vanilla. – Add the wet ingredients to the dry ingredients and mix just until combined and wet. Don’t over mix. A few lumps are okay. Fold in the apples. -Spoon the batter into the prepared muffin cups until nearly full. – Make the topping: Whisk together the flour, brown sugar, baking soda, salt and cinnamon. Add the softened butter and rub the mixture until sandy. Add the chopped walnuts. Press the mixture into clumps and sprinkle over muffins. – Bake the muffins for about 20 minutes or until a tester comes out clean. Cool muffins in the pan for 5 minutes and then move the muffins to a rack to cool completely. Wow, I love your adaptation to these muffins. 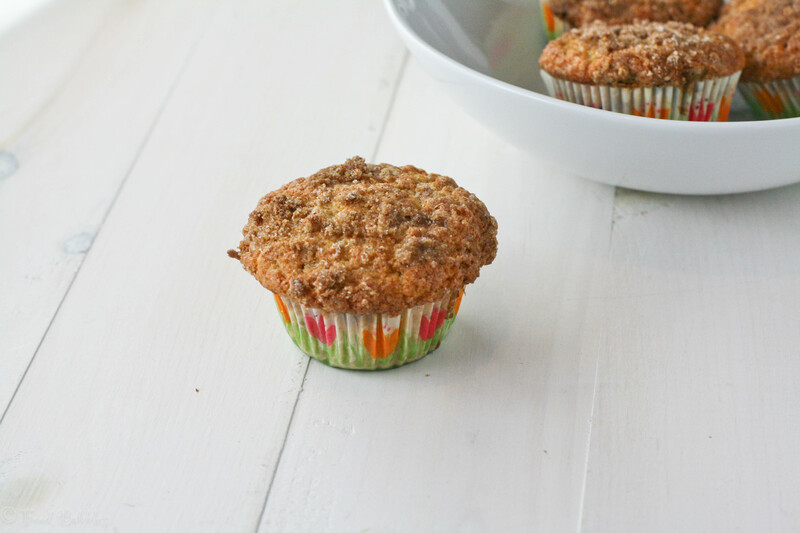 The walnut streusel topping sounds divine and I love adding apples to muffins. Well done! Muffin Monday is such a good idea! I haven’t heard of it, but would love to have muffins once a week! I would be happy to help the kids devour them; I love everything you’ve used together. Beyond that…it’s like fall here, not spring. Would be perfect! great improvising! i hate when I go to bake, expect an ingredient to be in the pantry then can’t find it but glad you were able to use what you had and come up with such a delicious muffin! Great twist on the recipe. Cinnamon makes everything right in the world. Baked these about two weeks ago. I like the recipe because I happened to have everything it requires at home on a Sunday night. It’s a great feeling when you find you have everything for a recipe in your cupboard. 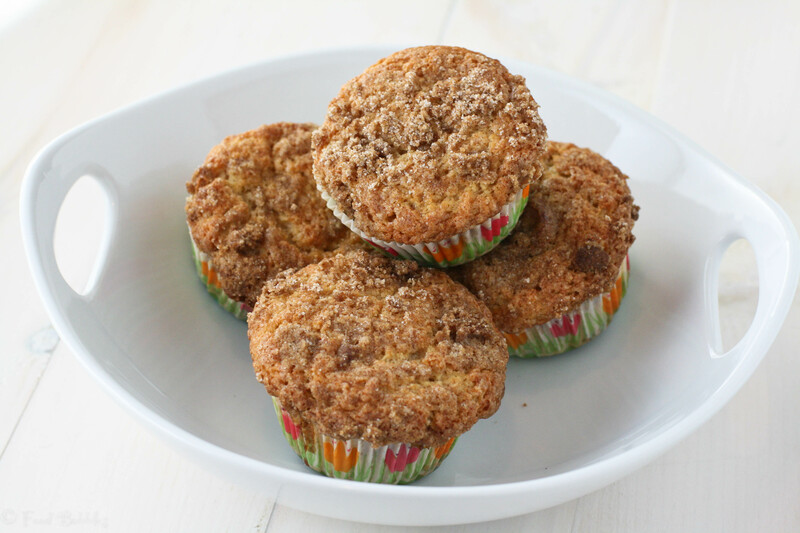 What I really loved about these muffins, besides the delicious apple and cinnamon combination, was the crispy topping. Well I did replace the walnuts with hazelnuts but it doesn’t make that much difference I guess. I have this habit of eating the bottom of the muffing first , so I can enjoy the best part -the top bit – the last. And this topping made it absolutely perfect.